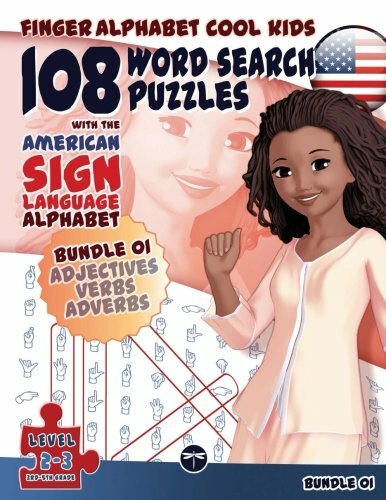 Have fun with these professional American Sign Language Alphabet word search games! This is the ultimate challenge for the truly fearless word search addicted who are looking for a new experience, or for fingerspelling aficionados eager to hone their craft. No matter what your fingerspelling ability level is even if you have never tried it before: This puzzle collection is sure to provide you with many hours of fun! ... looking for a new word search puzzle challenge? ... looking for ways to train your fingerspelling skills without the need for a partner? ... tired of seeing poor quality hand shape illustrations being used for sign language alphabet word search puzzles? ... looking for material that is suitable for kids and adults alike? Then this book might be just what you are looking for. The first three titles: ADJECTIVES, VERBS, and ADVERBS (vocabulary: 3rd-5th grade). The complete ASL Alphabet (fingerspelling) chart. Clearly marked levels of difficulty. Key solutions for each puzzle. Teachers: separate classroom licenses available via the publisher!